am i right?? After all I have to do some research to tell you all about the newest Series and hottest Movies who have been added onto the huge Netflix Database. I am quite happy to do some “overtime” a few nights a week because let’s face it Netflix is addictive and what other “job” comes with the chill factor of relaxing on the couch with a hot chocolate and some delicious bowl of popcorn especially in the colder winter times! If you are a House Fan like myself you will love this! The main actor Tim Roth is British which adds the little extra spark to it (for me at least). 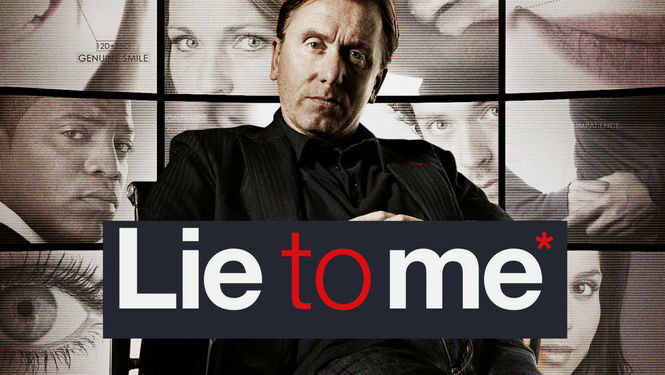 Its loosely inspired buy the career of psychologist Paul Edman, this engaging crime drama focuses on the work of Dr. Cal Lightman, whose knowledge of human facial and behavioural cues lets him determine whether a person is telling the truth. Its good, real good! Go and watch it you wont regret it! Yes it is as spooky as the poster looks like! I started to watch this together with Mr. C. but it was to gruel some for him so i continued on my own and I tell you this much when i was onto episode 8, i still didn’t have a clue what is actually going on but it’s gripping, spooky and most defiantly not for the faint hardest because it’s quite graphic when it comes to the dead people (and there are quite a few of those). 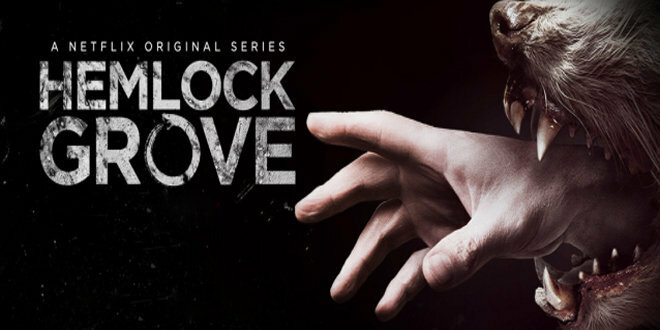 The Show examines the strange happenings in Hemlock Grove, a fictional town in Pennsylvania. Roman Godfrey, heir to the town’s wealthy Godfrey family, befriends the town’s newcomer, Peter Rumancek. Recent brutal murders in the town have stirred up rumours and the two work together to shed light on the case whilst also hiding their own dark secrets. 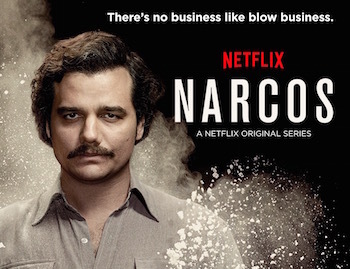 Narcos tells the true-life story of the growth and spread of cocaine drug cartels across the globe and attendant efforts of law enforcement to meet them head on in the brutal, bloody conflict. It centrist around the notorious Colombian cocaine kingpin Pablo Escobar and Steve Murphy, a DEA agent end to Colombia on a U.S. mission to capture and ultimately kill him. Its in subtitles and mostly in Spanish with English thrown into the mix. Its brutal, honest and gripping right to the end which makes it great entertainment. I love the fact that they put snippets of video recordings of the real Pablo Escobar and the happenings surrounding him. A squad of U.S. Marshals team up with cons (former fugitives) to work together on tracking down prison escapees in the exchange for getting time off their sentences. My favourite character is Lloyd (played by Jimmy Simpson) who is the brains behind the cons with a high I.Q. and a medical degree from Harvard he is responsible for the incisive physiological evaluations of their targets. of the prison escapees lives. was quite gripping and the plot was brilliant. 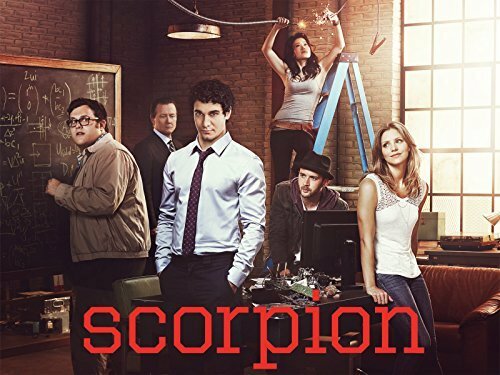 Scorpions is a high-octane thrill ride based on the true story of Walter O’Brien, an eccentric genius with the world’s fourth-highest I.Q and the creator of a company of brilliant misfits who use their mental muscle to defend the planet against complex high-tech threats of the modern age. Once again the Doctor is my favourite character and i am very close to the end of Season 1 and cant wait what else is expecting me!